The sister of an Uzbek man accused in the New York City truck attack that authorities say was inspired by Islamic State videos says the family is shocked and he never expressed extremist views to them. Suspected attacker Sayfullo Habibullaevic Saipov "never had any extreme ideas before," his sister, Umida Saipova, who lives in Tashkent in Uzbekistan, said in a text message to NBC News. "What happened in the USA was a shocking event for us and a shocking experience for our family," she said. "Certainly, we want to go to USA to help our brother and for a legal case to be justified if possible." Saipov, 29, was born in Tashkent and came to the United States on a visa through a diversity immigrant visa program in 2010, according to the Uzbek Consulate and U.S. authorities. 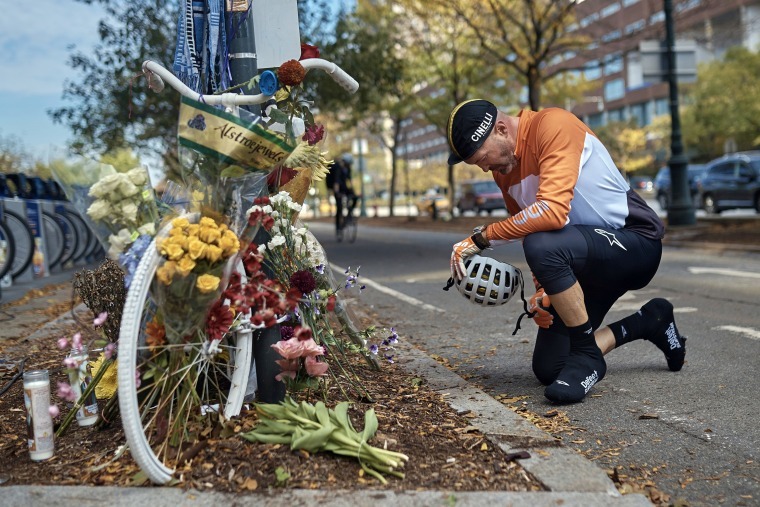 Police say he drove a rented truck onto a bike path along the West Side Highway in Manhattan on Tuesday, striking people in a terrorist attack that killed eight people. Sayfullo Saipov's driver license photo. Saipov was shot by police. He allegedly told law enforcement officers after his arrest that he was motivated to carry out the attack by Islamic State videos he watched on his phone, according to a criminal complaint. Saipov said he wanted to kill as many people as possible, asked if an Islamic State flag could be displayedin his hospital room and said he felt good about what he had done, according to the criminal complaint. He said he began planning an attack around a year ago and decided to use a truck around two months ago, according to the complaint. The rampage in Manhattan was the deadliest terrorist attack in New York City since the Sept. 11, 2001, attacks. The Islamic State terror group, also called ISIS, has claimed responsibility for the attack and called Saipov a "soldier of the Islamic State," but without providing any evidence of involvement. Law enforcement sources have said it appears that Saipov acted alone. Umida Saipova told Radio Free Europe that she believes her brother may have been "brainwashed" and hopes he gets a fair trial. President Donald Trump has said Saipov should get the death penalty. "We want to contribute to his defense as family," Umida Saipova said in the text messages to NBC News. The program under which Saipov was admitted to the United States allows the arrival of a limited number of applicants from countries with historically low rates of immigration to the United States. Those selected go through the same background checks and screening processes as any other immigrant visa applicant to be granted admission. Trump has called for an end to the program.